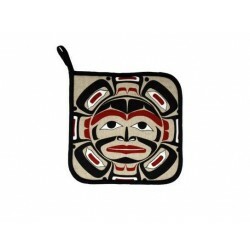 Klatle-Bhi (pronounced “Klath-Bay”) is an artist of Squamish and Kwakwaka’wakw ancestry. He grew up in the Kwakiutl culture of mask dancing, singing, and potlatching and has played a prominent role in the recent revival of the sea-going canoe journeys. Klatle-Bhi’s art is an expression of his personal and spiritual journey, as well as a reflection of his respective cultures.